The interlocking and associated tower at 43rd Street on the South Side main line were established in 1907 when the South Side Elevated Railroad decided, to increase capacity on its main line and run faster trains to meet demand, formulated plans at add a third express track between 12th Street and 43rd Street. The narrow right-of-way would make this difficult, so it was decided to use the alley that ran adjacent to the elevated for extra space. The city agreed to permit the company to do this in 1903, with several stipulations and requirements for the elevated railroad. For the most part, the existing northbound track became the express track and a new northbound local track was constructed to the east of the existing structure. By spring 1907, the work was largely completed. The express track ended north of 43rd Street, and at this point the line's three tracks converged back to two tracks for the remainder of the line down to the 63rd Street. Thus, an interlocking and control tower were installed at this location to control the movements of the trains through this series of switches. The tower was a two-story structure at track level, located on the east side of the right-of-way immediately south of the junction, clad in metal siding and toped with a hipped roof. The top level, where the switch levers were located, had windows on all sides to aid the towerman's viewing distance. Express service began on March 26, 1907. Because there was only one express track, express trains operated northbound in the morning and southbound in the afternoon. Express trains were able to make the trip from Congress to 43rd Street in just ten minutes. 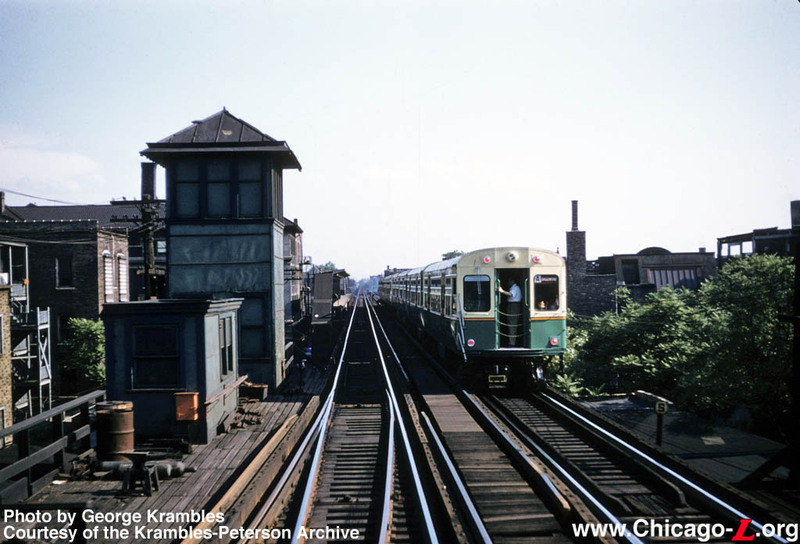 On July 31, 1949, the CTA instituted its North-South Route service revision. The operation of express trains on the mainline was discontinued, replaced with A/B skip-stop service during heavy ridership periods. As a result, one of the three tracks was removed from service on the mainline. West and north of Indiana station, the center track was removed from regular service, although it was kept operable for a number of years. Though Indiana station and south to 43rd Interlocking, the former northbound local track was removed from regular service, with northbound trains using the former bidirectional express center track. According to CTA-issued track maps from the period, at this point all the switches at 43rd appear to have been changed to hand-throw machines. Presumably, the tower was taken out of service at this time as well, although the building itself lasted at least into the mid-1950s. The former northbound local track between 43rd Crossover and Indiana station remained in use as the only connection between the mainline and the Kenwood branch, and was probably only used on the rare occasions when it was necessary to move equipment between the branch and the mainline such as to be swapped out or sent to the shop for servicing. Kenwood service was discontinued on November 30, 1957. The Kenwood and Stock Yards tracks were quickly removed, along with all switches associated with them. The former northbound local track between 43rd Crossover and Indiana remained, though not used for any regular service, until it was removed from service on July 20, 1966. The right-hand crossover at 43rd Crossover remained in service, but while the former northbound local track and the switch associated with it at 43rd were removed from service they apparently remained in place for a number of years: a 1971 CTA track map shows them still in place, but marked as "unused track." Presumably, the switch leading to this track at 43rd was spiked in the "normal" (i.e. tangent or mainline) position. By 1976, the track and switch disappeared from track maps, presumably having been removed. The right-hand hand-throw crossover remained in service as late as 1994. It was removed during the Green Line renovation of 1994-96. Today, there are no switches north of 43rd station, in the vicinity of the former 43rd Interlocking.